The Game Developers Conference was a fantastic experience for me this year! I gave two presentations — “Advanced Composition Techniques for Adaptive Systems” at the GDC Audio Bootcamp on Tuesday, and “LittleBigPlanet 3 and Beyond: Taking Your Score to Vertical Extremes” during the main conference on Friday. I had a great time! Here are a few of my photos from GDC week. Just click on the first thumbnail image to open the full-sized gallery. Starting a GDC day the good old-fashioned way… at Mel’s Drive-In! Always get excited when I see that big GDC banner! The audience for the GDC Audio Bootcamp begins to fill up on Tuesday morning. My speech on adaptive music begins! A discussion of the interactive music system of the Sound Shapes game, using the “Cities” track by Beck as an example. My speech included some discussion of music data, including MIDI, MOD and generative systems, and then there was a Q&A. Such a great audience! The next day, I participated in the GDC Flash Forward, which allowed a select group of GDC speakers the chance to each present a 30-45 second preview of their presentation for the main conference. These are the fantastic MCs of the Flash Forward, Brenda Romero and Laura Fryer! After the Flash Forward, the main GDC sessions and expo began in earnest. Favorite memories from this year’s GDC include meeting with the awesome Robert Workman, game journalist extraordinaire! This is Yerba Buena Gardens, a beautiful park just a few steps away from the convention center. Great place to unwind after the sessions! The weather in San Francisco was gorgeous for GDC this year! There’s my talk! Bright and early on Friday morning! 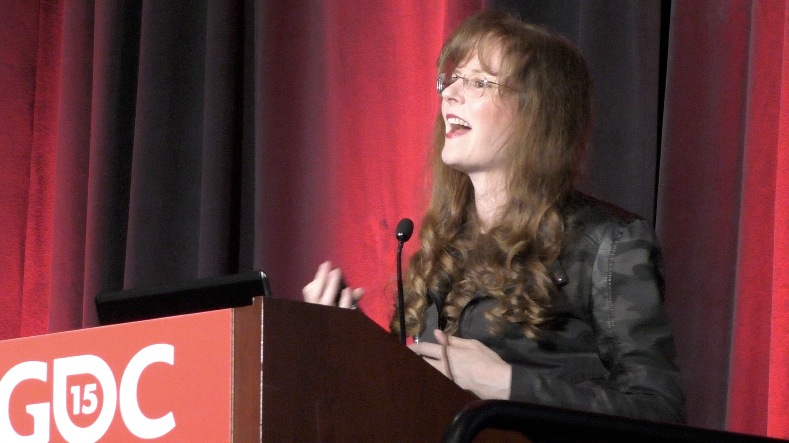 I was tremendously proud to have been chosen as a GDC speaker this year! Under the imposing mask is Jesse Lofton, one of the GDC conference associates. He’s guarding Room 3006, where my Friday session took place. This is the sign that stood outside Room 3006, where my session took place. My talk kicked off the last day of the conference. So proud to have participated in GDC this year! I was honored to be selected by the Game Developers Conference Advisory Board to present two talks during this year’s GDC in San Francisco earlier this month. On Friday March 6th I presented a talk on the music system of the LittleBigPlanet franchise. Entitled “LittleBigPlanet 3 and Beyond: Taking Your Score to Vertical Extremes,” the talk explored the Vertical Layering music system that has been employed in all of the LittleBigPlanet games (the soundtrack for that game is available here). I’ve been on the LittleBigPlanet music composition team for six of their games so far, and my talk used many examples from musical compositions I created for all six of those projects. After my talk, several audience members let me know that the section of my presentation covering the music system for the Pod menu of LittleBigPlanet 3 was particularly interesting – so I thought I’d share the concepts and examples from that part of my presentation in this blog. That’s me, giving my GDC speech on the interactive music system of the LittleBigPlanet franchise. Here I’m just starting the section about the Pod menu music. The audio team at Media Molecule conceived the dynamic music system for the LittleBigPlanet franchise. According to the franchise’s music design brief, all interactive tracks in LittleBigPlanet games must be arranged in a vertical layering system. I discussed this type of interactive music in a blog I published last year, but I’ll recap the system briefly here as well. In a vertical layering music system, the music is not captured in a single audio recording. Instead, several audio recordings play in sync with one other. Each layer of musical sound features unique content. Each of the layers represents a certain percentage of the entire musical composition. Played all together, we hear the full mix embodying the entire musical composition. Played separately, we hear submixes that are still satisfying and entertaining for their own sake. The music system can play all the layers either together or separately, or can combine the layers into different sets that represent a portion of the whole mix. When implemented into gameplay, layers are often activated when the player moves into a new area. This helps the music to feel responsive to the player’s actions. The music seems to acknowledge the player’s progress throughout the game. It’s important to think about the way in which individual layers may be activated, and the functions that the layers may be called upon to serve during the course of the game. 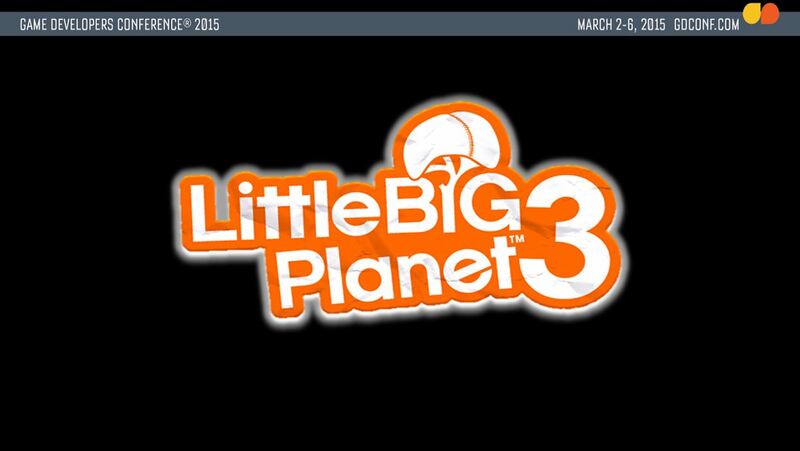 In LittleBigPlanet 3, the initial menu system for the game is called “The Pod.” The music for the Pod is arranged in vertical layers that are activated and deactivated according to where the player is in the menu hierarchy. All the layers can be played simultaneously, and they play in multiple combinations… however, each of the individual layers is also associated with a specific portion of the menu system, and is activated when the player enters that particular part of the menu. As the player navigates the Pod menu system, these various music layers are activated to correspond with the player’s location within the menu hierarchy. This sort of dynamic music triggering lies at the very heart of the Vertical Layering interactive music mechanism. … or it can be altered radically, with large scale activations or deactivations of layers. Even with these kinds of dramatic changes, the musical composition retains its identity. The same piece of music continues to play, and the player is conscious of continuing to hear the same musical composition, even though it has just altered in reaction to the circumstances of gameplay and the player’s progress. As you can see, triggering unique musical layers for different portions of the menu system helps serve to define them. I hope you found this explanation of the Pod music to be interesting! If you attended GDC but missed my talk on the interactive music of LittleBigPlanet, you’ll be able to find the entire presentation posted as a video in the GDC Vault in just a few weeks. In the meantime, please feel free to add any comments or questions below! It was wonderful to sign copies of my book last week at the book signing event organized by The MIT Press for my book, A COMPOSER’S GUIDE TO GAME MUSIC! The book signing took place on March 6th at the official GDC Bookstore in the Moscone Center (South Hall) during this year’s Game Developers Conference in San Francisco! It was a lot of fun! So terrific to meet such a great group of composers and sound designers, and I loved hearing about your creative endeavors in the world of game audio! I’m also very humbled and pleased that you’re using my book to help you with your projects! Here’s a gallery with pictures of some of the folks who were at the book signing last week! Just click on the first thumbnail image to open the full-sized gallery. This was the placard that was posted at the front of the GDC bookstore throughout the Game Developers Conference 2015! I’m getting ready for the book signing! Signing a book for Rena! Thanks for coming to the signing, Ashley! It’s nice to meet you, Ashley. A fine gentleman at the book signing! Great to meet you Kevin! Great to meet you, Jade Kim! Aaron gives us the thumbs up! Nice to meet you, Aaron! Another fine gentleman at the book signing! Thanks for coming to the signing, Renzo Heredia! Great to meet you, Zachary! Joshua Du Chene gives us the thumbs up! Thanks for buying my book, Joshua! Great to meet you, Feona Lee Jones! Great to meet you, Brett!